This Dictionary (CDCH) is an abridgment of the 8-volume Dictionary of Classical Hebrew (DCH). 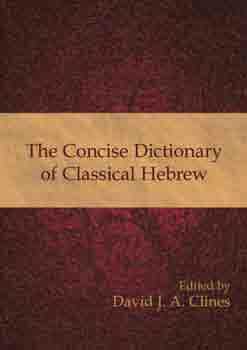 The DCH, the first volume of which appeared in 1993, was the first dictionary of the Classical Hebrew language ever to be published. Unlike other dictionaries of the ancient Hebrew language, which cover only the texts of the Hebrew Bible, either exclusively or principally, DCH records the language of all texts written in Hebrew from the earliest times down to the end of the second century CE. That is to say, it includes not only the words used in the Hebrew Bible, but also those found in the Hebrew Book of Ben Sira (Ecclesiasticus), the Dead Sea Scrolls, and all the ancient Hebrew inscriptions. The CDCH thus contains not only the c. 8400 Hebrew words found in the standard dictionaries, but also a further 3340+ words (540 from the Dead Sea Scrolls, 680 from other ancient Hebrew literature, and 2120+ proposed words for the Hebrew Bible not previously recognized by dictionaries). All the words in the full Dictionary of Classical Hebrew are to be found in the CDCH. The CDCH has been designed to be clear, concise and easy to use. The Hebrew words are arranged in alphabetical order, so it is not necessary to know the ‘root’ of a word to look it up in the Dictionary. All the Hebrew words and phrases quoted are accompanied by an English translation. At the end of each entry on verbs is a list of the nouns derived from that verb; and at the end of each entry on nouns a reference to the verb from which it is derived (when known). For every word the numbers of its occurrences in the four main corpora of classical Hebrew (the Bible, the Dead Sea Scrolls, Ben Sira, and the ancient inscriptions) are noted. All the proper names in classical Hebrew texts are included, with their correct spellings in English. Previous dictionaries have generally been revisions and adaptations of earlier dictionaries; DCH and CDCH result from a completely fresh re-examination of the texts and an independent analysis of the meanings of Hebrew words. Rich in examples and citations, this edition will be of immense value to students at all levels, as well as to working scholars who will not always be in a position to refer to the complete DCH. The Concise Dictionary of Classical Hebrew is a useful tool gathering in a single book the best features of the Dictionary of Classical Hebrew. It is a compact volume that will become a required reference tool for everyone engaged in research of Hebrew literature, from the Bible to the Inscriptions. Of course, it is reasonable to imagine that scholars may want to consult the larger Dictionary of Classical Hebrew, but the Concise Dictionary of Classical Hebrew still has the potential of becoming a one-stop, handy resource. For that reason, it is a welcome addition to the libraries of individual scholars and academic institutions. Gilbert Lozano, Review of Biblical Literature.